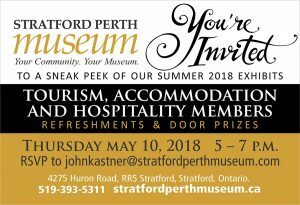 If you have anything to do with tourism in Stratford you do now want to miss the Stratford Perth Museum’s annual kickoff May 10 from 5-8 p.m. we You are all invited to the Museum so we can brag , we mean tell you, all about our exciting exhibits for 2018. We will have refreshments, snacks, prizes, lots of fun and big news! And if you work in the tourism industry, we will have rack cards for you to take with you. Please RSVP so we have an idea for numbers – we don’t want to run out!